As each season reaches its fullness we can recall the day the calendar said it was so. It is a good thing that what is written in ink on the page doesn't come to pass with such immediacy. The shock of the change would be more than we could take. Come late September the page on the wall says that autumn has arrived. The leaves on the trees do not instantly leap into flame nor do the temperatures drop alarmingly and remain cool. It is that nearly imperceptible change that begins over the course of days and weeks. The heat of the day doesn't reach the height it did in August while the nights are noticeably cooler and quicker to come. Rather it's an up and down and back and forth motion that sets up what is to follow. So like the pendulum, the wheels and the gears turn ever onward. There isn't a season that I don't embrace, but autumn is always the most anticipated. It heralds the most dramatic of changes—even over the greening of spring. Death is always most vivid as it plays from the stage. With fall come all the rituals that the warmer weather lacks. Halloween, Thanksgiving, and the build toward the Christmas season all fall with this realm. Autumn gives way to winter with little fanfare outside of the theatrics of a snowfall. This morning we seemed to inch a little closer to real fall and not just because the calendar said so. There was a wind that held steady only to pull back occasionally so the sound of the falling leaves could make their statement. I could hear them falling with a certain cadence of the required dance. Each shushed its way down to lay upon the cushion of the still green grass. Autumn asserts herself more with each passing day. The sun may shine brilliantly but there are undertones of cold as the wind that whispers never dies. The first blotches of gold, red, and rust dot the landscape. The fields of corn faded into tan signaling the harvesters to reap and thus ready that patch of earth for next spring's planting. Other crops, the soybeans, have suddenly gone to rust. It seemed only days ago they were a vibrant green. The combines seem to run day and night, the rattling old trucks that carry the bounty grumble down the road ferrying them off to safekeeping. The geese honk their good-byes as they finish gleaning the fields after the harvesters have gone and the wooly-bears are on the march. Everything is active. Everyone is busy. It's the harvest season come again. Within our homes we stock our larders again the coming cold. The cool, crisp salads and foods from the grill of summer give way to meaty soups, homemade breads, and other belly-filling foods that soothe our hunger while assuaging our souls. We long to be like the little ant that worked so hard to be safe and ready to enjoy the season's end and not the grasshopper. We check our roofs to ensure all is well. We call the furnace man to turn aside our worries and fill our tanks with fuel. We open our windows to blow away the dusty dregs of summer while we clean and scrub and wash. We rediscover the wonders of living indoors. Meanwhile, forays out of doors are just as delightful. Armed against the chill, we bundle ourselves in an old thick jacket just to walk about in the yard. The air is fresh, clean, and always in motion. Taking the laundry basket to retrieve the laundry is always exhilarating because the fabrics have captured that crisp scent and we can take it indoors. That perfume, stolen from the wild, only lives for a short while. The sun sets; night begins to fall. All around us is that heady nutty fragrance. It is a time of fleeting delight. 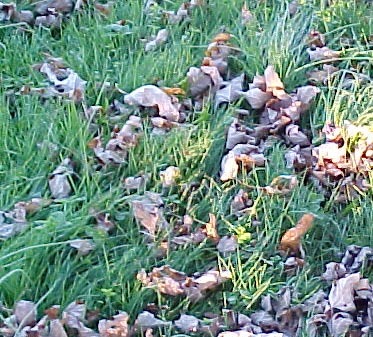 It all begins with leaves on the grass.